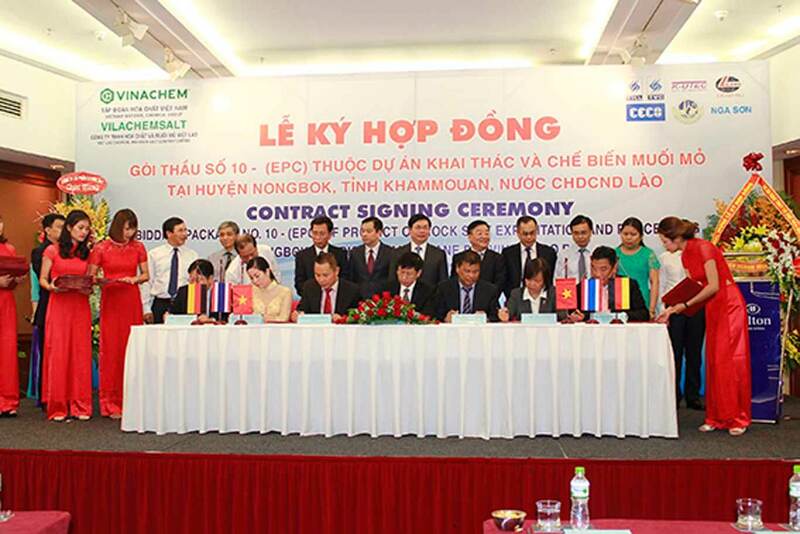 On afternoon Aug 12, Vietnam National Chemical Group (Vinachem) and Viet Lao Chemical and Rock Salt limited company (Vilachemsalt) signed a contract with Join – venture Contractors TTCL/K-UTEC/CECO for the package No. 10 – Design, supplying equipment, construction, training, technology transfer, test run, booting the system, check and take over the plant (EPC) on exploitation and processing project in Nongbok District, Khammquane Province, Lao People’s Democratic Republic. On 04 March, 2013, the Minister of Industry and Trade signed a decision approving the investment construction project on construction No. 1284 / QD – BCT. On 06 Mar, 2013 the Vietnam Ministry of Planning and Investment granted an investment certificate for the exploiting and processing rock salt project in Laos. The project was also granted investment certificates, building license by Lao’s Government. Based on Procurement Plan was approved by Vinachem’s Council member, Viet Lao Chemicals and Rock Salt Limited Company (Vilachemsalt) cooperated with Vinachem organized bidding package No. 10: design, supplying equipment, construction, training, technology transfer, test run, booting the system, check and take over the plant.